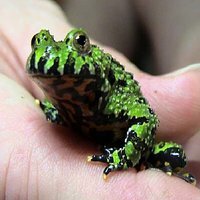 The oriental fire-bellied toad seems fairly nondescript—a green toad with black spots blending nicely with the verdant colors of its habitat. It’s not until it perceives a threat that this flashy amphibian reveals its true colors. Oriental fire bellied toads are hardy little toads that are suitable for beginners. They are not difficult to care for, although they do take a fair amount of work to maintain. Native to southern and southeastern Asia, they are noted for their bright green and black coloration on their backs, and brilliant orange and black on their underside. These bright colors serve as a warning to predators (as in "I'm toxic!"). While not the most toxic of amphibians, regular handling is not recommended (avoid if there are cuts on your hands) and your hands should always be washed thoroughly immediately after touching the frog (or cleaning the tank for that matter). It is not recommended to house these toads with other species due to potential toxicity problems, though. Regular cleaning and water changes will help keep the toxins from building up in the tank. A minimum 10 gallon tank is recommended, although 2-3 frogs can be housed in a tank of this size. A larger number of frogs will happily live together in a larger tank (allow about 4 gallons of tank space per frog, and the long style aquariums provide more "floor space" for their size). A secure lid is a necessity, as these active little frogs will escape given the chance. The top should allow adequate ventilation. A semi aquatic tank is the ideal set up, with 1/3 - 1/2 of the tank as a land area and the remainder as water about 2-4 inches deep. The land area could have rocks (which should be smooth to prevent injury to delicate frog skin), damp moss, plants and some areas to hide. The water should have a filter, and frequent water changes are necessary. Use only dechlorinated stale (let sit 24 hours) water or bottled spring water in the tank. These frogs produce quite a bit of waste so frequent partial water changes should be done. Smooth gravel can be used to line the water side, and live or artificial plants can be used. A heater is not usually necessary as these frogs can handle room temperature, although warmer temperatures are considered more ideal by some (75-78 F or 24-25 C). A basking area can be set up with a low wattage lamp (use a thermometer and aim for about 78 F). Fire bellied toads do not have extendable tongues, so use their mouths to grab their food and stuff it into their mouths with their forelegs. They will take a variety of prey items, including crickets and other insects, worms (such as waxworms and earthworms - mealworms are probably best avoided due to their tough exoskeleton), and even some small feeder fish such as guppies. Prey should be gut loaded, and dusted with a multivitamin powder. These toads generally have good appetites and usually do not have a problem eating in captivity. Adults typically only need to eat 2-3 times a week, and watch that the frogs do not become overweight. One of the most common amphibians in its primary range, oriental fire-bellied toads thrive in northeastern China, Korea, southern Japan, and southern parts of Russia. They are highly aquatic and usually found in slow-moving streams and ponds. When out of water, they stick to the region’s coniferous and broadleaved forests. They hibernate from late September to May, sheltering in rotting logs, leaf piles, and occasionally at the bottom of streams.